Cleaning your home is never an easy task, especially when you have a busy schedule to work with. When it comes to the best housekeeping Houston solutions available, there’s bound to be many choices. However you don’t want to just hire anyone for the job. Finding the best Houston maids in your area to come and clean your house is vital. But just how can you find the Houston maids that are best suited for your home? This guide can help, with a handful of tips that can point you in the right direction. Have a busy schedule and just can’t find the time to clean your home? Companies in your area are ready to help. Because you don’t want to trust you house to just anyone, these tips can help you find the best maids available in Houston. Reputation – In this day and age, there’s no reason to risk leaving your home to just anyone. Research the maids you are looking to retain and make sure that they’ve got a good mix of positive reviews. With a good clientele and lots of good reviews, you can be sure that their service is top notch. The last thing you want to do is come home to a bigger mess, or find that you picked the wrong house cleaning service Houston has to offer. To this extent, go online and browse through review websites. Check out the local Home and Garden listings and don’t be afraid to ask the pro you are looking to hire for references. The best cleaning companies will have plenty of reviews for you to read through, you just need to look. Variety of Service – Maybe you’ve got guests coming over for an important social event, or there’s such a big mess you just can’t handle it. Perhaps you are heading out of town and need someone to come in and clean up. Or you are throwing a huge get together, and time is of the essence. No matter what your needs, the best Houston maids will have the right package of services for you. No two cleaning jobs are the same, which is why you need to find the best housekeeping Houston can offer. With a wide range of different services, you should be able to pick and choose the house cleaning service you want. Being able to customize the job is one of the biggest factors that sets the best apart from the pack. Trustworthiness – Let’s face it, you need a cleaner that you can rely on and trust. Not only to show up when you need them, but to keep the house clean and without any accidents. Meeting and discussing your home cleaning service needs is often the best way to find the right fit for. You want to be able to leave your home in the right hands, and not have to worry about things missing or broken when you return. That’s why meeting with the right house cleaning service Houston has to offer can mean a world of difference. You’ll be able to put a face to the name, and see just how they operate. From the first time you meet your Houston maids, make sure to observe how they talk and treat their customers. Often times it can be a clear indicator as to what kind of business they really own. Specialized Tools – Whether you have a hardwood floor or custom chandeliers, not all housekeepers will have the right tools to service your home. If you have a concern, make sure to voice it to the company you are looking to hire. Having the right tool for the job can minimize damage, save time and ensure that your home is cleaned in a timely fashion. Cleaning Service – You want the most trusted residential cleaners to clean your Texas home, because you don’t want to have to do it yourself. Worse yet, when you hire the wrong house cleaning services in Houston, you might even need to ask them to come back. The best Houston maid is the one that gets the job done thoroughly and will go above and beyond to retain your business. When you find a Houston maid service like that, you don’t want to let them get away. That’s why finding the best house cleaners is a good idea when you need house cleaning in Texas. You need one that will deliver and be happy to do whatever it is you need to have your home cleaned. Your choice should understand that a clean home means a happy customer, which means repeat business for them. 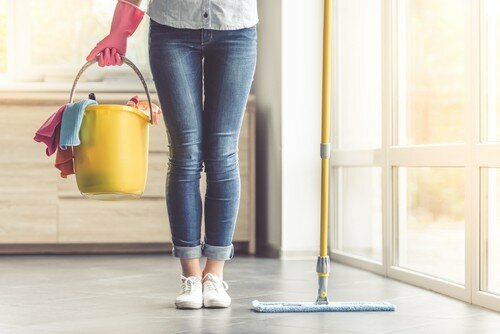 Make sure to pick the best house cleaning service Houston has to offer by checking out the level of their service; it can really tell you a lot about any company. These tips can help you determine the best Houston maids in your area, and make the right choice in hiring one. When you have no time but need your home cleaned fast, turn to the best housekeeping Houston can offer with Ready SET Maids. Our expert staff is trained with the latest tools and will make sure your home is completely cleaned the first time. Have any questions? Get a quote fast by booking a cleaning in less than 60 seconds here. Overall living healthier by having a service should not be overlooked for you and your family. Finding a great service can be both rewarding and enriching for the entire family dynamic. Just be sure that you share any customized options you want with the service so they know exactly how to cater to your overall needs when you get started.